While most of the time I use my right hand fingers to pluck the strings when playing bass, there are definitely sounds and styles that require using a pick. Especially if you are a rock bass player, I would put becoming familiar with using a pick at least somewhere on your practice list. Being able to play with your fingers as well as a pick is going to give you a wider variety of tonal and technical possibilities. Watch the video lesson below to see me demonstrating the examples as well as some additional insight. First a couple of basics about picks if this is a foreign object to you. Picks come is all kinds of shapes, sizes and thickness. You may want to go to your local music store and buy a variety of different picks and do a little experimenting to find what is right for you. To start I might consider using just a standard size and shape pick that looks like the picture below. I would avoid really thin picks. Try and start with a medium to a heavy pick. 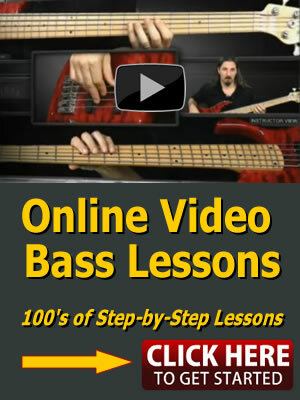 You will also see different bass players hold the pick in different ways. 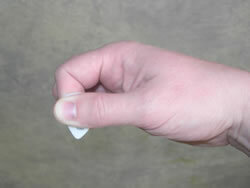 I hold my pick with the flat part of my thumb, and the side of my index finger. I feel this gives me the most amount of control. We are going to get to some real music shortly, but before digging into that I want you to practice a basic E minor pentatonic scale picking down and up 4 times on each note. You are playing 16th notes, and a 16th note is a quarter of a beat, so there will be four 16th notes in every beat. You may want to emphasize the 1st note in every group of 4 to help you keep your place. Practice the notes slow and even, and then increase the speed as you become more comfortable. Practicing a scale is great for developing your bass technique, but if you can build your chops and play something that sounds like real music that’s even better. So here is a rock bass riff that uses constant 16th notes to help you improve your picking. Start slow and practice 1 measure at a time. Work on getting a clean sound from your notes. Playing fast and sloppy will only move you further from your goal. You should also make sure that you practice with a metronome or drum machine. Below are a couple of drum grooves below that you can practice with as well. Here are 2 rock drum tracks that you can use to practice with. One is at 75 beats per minute, and the other is at 100 beats per minute.